Forex trading is not for the faint of heart. This 24 hour-a-day market is the largest in the world yet most casual investors have not dabbled in it and for good reasons. The risks are high – even small currency moves can swing portfolio values up and down by large amounts – and the terminology is different to the general stock market. But for the more adventurous investor who wants to add a speculative component to an existing portfolio, forex trading offers as many thrills as a rollercoaster ride and perhaps even more! Forex trading is different from stock market trading in many ways, including the hours the market is open, the trading counterparty, and the leverage involved. You don’t need a huge amount of capital to get started in Forex trading. With a few hundred dollars, you can make a wager on whether a currency will rise or fall. And while you don’t need a whole lot of cash to get started, FX trading is by no means a shortcut to riches. The slow and steady path of buying the best index funds and dividend paying stocks, and not putting all your eggs in one basket are a better choice for most. Nevertheless, the allure of forex trading is obvious. Small cash outlays can lead to quick wins (and losses). If you have come from the world of equities investing or options trading, you will need to know how forex differs. Perhaps the biggest difference between forex trading and stock trading is that currencies are traded in pairs. This simply means that when you trade a currency, such as the U.S. dollar, you always exchange it for another currency, so trading takes place in pairs. The currency listed first, GBP, is equal to one unit of the currency, so in this case it is one pound sterling. The currency listed second, USD, represents how many units of that currency can be bought for one unit of the first currency. In this example, one pound sterling buys 1.30145 U.S. dollars. The first currency is called the “base” currency while the second currency listed is the quote currency, also called the counter. It means that the Pound Sterling has strengthened because one pound sterling buys more U.S. dollars than it did before. The order of the pairs is fixed, so “cable” is always listed with the pound sterling shown first as the base currency and the U.S. dollar always as the quote or counter: GBP/USD. When you buy one currency, you are always selling another. So, if you want to buy the Pound Sterling and sell the U.S. dollar, you would buy GBP/USD. And if you wanted to sell the Pound Sterling and buy the U.S. dollar, you would sell GBP/USD. If you ever exchanged money at an airport, you can call yourself an FX trader. And if you are familiar with buying and selling stocks, you may have looked quizzically at the exchange rate board at the airport currency exchange kiosk. That’s because Forex quotes are displayed from the dealer’s perspective. Bid Price Equals how much of counter currency you can buy when selling a unit of base currency. Ask Price Equals how much of counter currency needed to sell one unit of base currency. >> Travel Tip: If you ever spotted a “No commissions” sign at a foreign exchange desk at an airport, the “catch” is the exchange desk makes money from the “spread” which can be large. Take our example above for cable and we’ll assume the following bid-ask prices. So you could buy 1 pound sterling for $1.30157 (the Ask price) and you could sell 1 pound sterling for $1.30145. It means that the Bid price is 1.30145 and the Ask price is 1.30157. Unlike companies trading on stock market exchanges, such as the New York Stock Exchange or NASDAQ, currencies are traded globally on a decentralized market. In the stock market, shares exchange hands whereas on the Forex market, lots exchange hands. Risk and reward increase when you move from micro lots to standard lots. Beginner Forex traders should be cautious about trading standard lots because the portfolio swings can be enormous. Another difference with stock trading is that Forex pairs move by amounts called pips. Where share prices go up by pennies or points, Forex pips are used to denote when a currency pair has changed value – it’s the smallest unit by which a currency pair changes value. And here’s where it gets tricky, a pip means something different depending on whether you are trading micro, mini or standard lots! In our example, the difference between the Ask price of 1.30157 and the Bid price of 1.30145 is 0.00012. The second last digit usually represents the smallest price movement, so the spread is 1.2 pips, or $0.12 on a micro lot, $1.20 on a mini lot and $12 on a standard lot. When you invest in the stock market, your broker may permit you to use portfolio margin. For example, if you have $100,000 in a brokerage account at thinkorswim you may be able to purchase as much as $200,000 in stock. Margin is a way for you to borrow funds to buy stock, thereby amplifying gains and losses. If a stock rises 10% and you are using 100% of your portfolio margin, you will enjoy a 20% return on your cash minus the margin interest cost. It works in reverse too, so if a stock declines by 10% and you are using 100% of the portfolio margin made available to you then you will lose 20% of your cash plus you still must pay margin interest. If you think that’s scary, then Forex is downright frightening! Forex brokers typically permit you to borrow 10x, 20x and even up to 50x the cash you have in your account. So very small swings in price can lead to very large gains and losses in your account. Now let’s take the example where you want to buy GBP/USD at 1.30145/57. A micro lot of 1,000 units would cost you $1,301.45 for 1,000 pounds sterling. A mini lot would cost you $13,014.50 for 10,000 pounds sterling and a standard lot would cost you $130,145 for 100,000 pounds sterling. The numbers become dazzlingly high in a hurry, so to lower your cash outlay, you could look to tap into the leverage your broker offers. For the mini lot (of $13,014.50), 10:1 leverage would mean ponying up $1,301.45. If you used 50:1 leverage, you would only need to come up with $260.29 out of pocket. Currencies tend not to move by much on any given day so leverage allows you partake in FX trading with less cash. But when currencies do move, watch out! When Brexit was announced, the pound sterling crashed overnight. Due to the amplifying factor of leverage, large currency moves in the wrong direction can wipe out an account in no time. 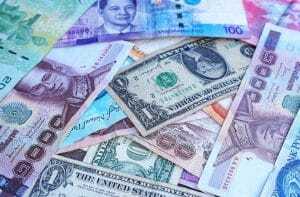 As you become more familiar with FX trading, you will discover that some countries employ a fixed exchange rate, called a currency peg, whereby a currency’s value is fixed to the value of another currency or a basket of currencies, or even to gold. The idea behind a currency peg is to stabilize a currency by fixing its value to a specific ratio. Currency pegs often succeed for long time periods but market forces often win in the end, breaking the peg. During these periods, volatility spikes and currency traders are often subject to enormous swings in account balances. While famous examples in history of currency traders winning, such as George Soros and Jim Rogers “breaking the Bank of England” in the 1980s, few casual traders are so lucky. So, if you are keen to try Forex trading, start with a paper trading account or virtual trading demo account, and above all, be wary of using excess leverage. Have you traded forex? What were the pros and cons. Share your trading stories with us, we would love to hear from you. >> How Did Warren Buffett Get So Rich? >> What Are The Top 5 Investing Lessons?